The Independent reported this week that ‘China's exploding wealth has created a culture of secret mistresses and second wives. Now officials are putting marriage records online so spouses can check for cheaters’. It’d be more accurate to say that the age-old Chinese practice of wealthy men taking mistresses as a sign of social status has been rediscovered and given a new twist in decadent, contemporary China (‘concubines’ used to be the standard Orientalist translation of the Chinese word 姬 ji, but that sounds a touch too exotic and patronizing for my liking!). Cara Anna, who wrote this short piece in the Indie, then goes on to say: ‘But the Ministry of Civil Affairs a few years ago said such a project would be operating by 2010 [rather than 2015 as it’s now saying]. Officials have not explained the delay... .’ This is a really niggly point, I know, but I’m not quite sure why it needed that ‘But...’ at the start of the sentence. It’s always a temptation, when writing about China, to score easy points by showing how its state machinery so often fails to deliver (guilty as charged in my own writing, many times over), but in this case I think China deserves a good deal of recognition for what it’s achieving. Of course, it’s fair to point out that the Ministry has been caught failing to live up to its own timescale, yet it’s worth pointing out that the UK government consistently takes years or decades longer than it plans to deliver IT projects; more pertinently, when this plan finally comes together in 2015 or whenever, China will in fact be a country mile ahead of the UK by having a public database of marriages. We’ve had civil registration procedures in place in this country since the 1830s, and all marriages (with minor exceptions) are publicized beforehand by the calling of banns or the publication of names at a register office. It’s these measures that are meant to stop problems like bigamy, but of course nobody spends their afternoons reading lists of names outside their local town hall, and with no centrally accessible database where a registrar or vicar can simply search for a person’s name (or in China’s case identity card number), it’s nigh on impossible to tell whether or not the bride or groom is already married to somebody else. We’ve had a spate of cases recently involving bigamists and sham marriages, and we only seem to have people’s honesty to rely on. This is definitely one example of China being ahead of the curve; I hope the UK is watching to see how things work out. Trouble breastfeeding? Try pig's trotter soup. As a lover of China and its culture I’m proud to be what the Chinese themselves approvingly call a Zhongguotong—what we might call a Sinologist or an 'old China hand'. Perhaps 'middle-aged China hand' would be better? My travels to China began in 1991 when I was a degree student of Mandarin. After graduating I read Ancient Chinese History at Fudan University, and over the years I’ve lost count of the times I’ve been drawn back. I’ve spent time in most of the nation’s provinces and regions, visited its four most distant compass points, and navigated the entire 1,115 miles of the Grand Canal from Hangzhou to Beijing. A single lifetime isn’t enough to do justice to a country larger than continental Europe, with 3,000 years of recorded history and 1.3 billion inhabitants, but each year I try to add a few new pages to my travel diary. 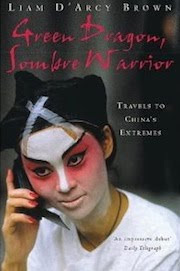 Since 2001 I’ve been writing about my experiences of a changing, modern China. 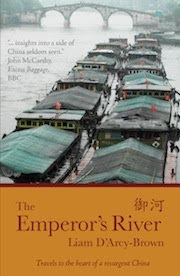 My first book, Green Dragon, Sombre Warrior, was published by John Murray, and my second, The Emperor’s River, is on sale now, published by Eye Books. There are links to both of these through the cover images below. Copyright 2011- Liam D'Arcy-Brown. Simple theme. Powered by Blogger.